On Sunday, "R" and I held a "Tailgate for a Cause" to help me raise money for the American Liver Foundation. I have been managing the Liver Life Challenge team for three years now, and this year, I decided to put my money where my mouth is and I joined the team. I started training in September to walk the Walt Disney World half marathon in January. I also committed to raising $2,800 for the program, which is no small feat. "R" and I love to tailgate, so I thought that it would be a fun way to raise some needed funds. I invited friends to join us in the Dock 20 parking lot by the lake, and we put out a spread of appetizers and a build-your-own taco bar. A Bloody Mary bar, mimosas, and beer helped with the fun factor, and it helped us forget that we're up early on a Sunday. Also, my family was in town from NY! So many of our friends came out to support me and my fundraising efforts. Thank you! I think every tailgate should have a piñata. Maybe we can start making one to represent the opposing team? One appetizer that was a big hit was the Buffalo Chicken Dip. I found a photocopied recipe in our binders that had hand-written "Better Dip" on it. No idea where I got it from, but it was a crowd-pleaser, so maybe I'll have to share that with you too. For now, I wanted to share the recipe for the other dip that we served- Pumpkin Pie Dip. I headed to Pinterest in preparation for this tailgate, and it didn't disappoint. Cut up apples to dip. We served it with freshly sliced honey crisp apples and pita chips. Thank you to everyone that came out to our tailgate. I am now just $225 short of my fundraising goal. Amazing! The winner of the Parkers and Great Lakes tasting event tickets did not contact me by the deadline, so it's time to select another winner using random.org. The new winner is...comment #9- fmayse. Congratulations! Please email me by Friday to claim your prize, or another winner will be selected. What did you do this weekend? We packed a lot in. My family was visiting from NY, and we were go-go-go all weekend long. 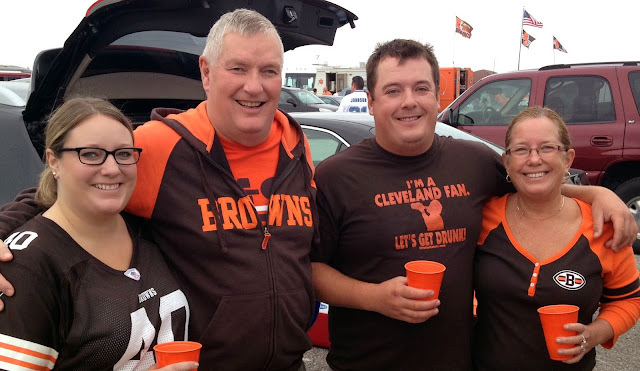 We spent a lot of time getting ready for our Browns tailgate, but I wanted to make sure that we also showed off our city a bit while they were here. Saturday was this month's Cleveland Flea, and it was my first time attending. Have you been yet? I absolutely love decorating our house, and there were so many booths dedicated to housewares and artwork. With more time, I think that I would have found some great stuff. We all love to show off our city pride, and there were plenty of vendors that were selling some great Cleveland gear and artwork. I had my eye on a piece for our new kitchen, but didn't take the plunge to purchase it. How fabulous are these CLE glasses? There were a couple of vendors on site that were selling food and other treats, but you also had two lunch/snack options from local food trucks. Sadly, almost everyone was out of food by the time that we had arrived. It was a fun, and free, excursion for the afternoon. It is also family and pet-friendly. Check out their Holiday Show on November 23rd and 24th. Follow them on Twitter, or "like" their page on Facebook to stay updated. I love this new addition to our community! First things first...let's pick a winner of the two tickets to the Great Lakes Brewing Company and Parkers Grille and Tavern tasting on Tuesday, October 29th. Thank you to everyone that entered the giveaway. Using random.org, the winner is.... Comment #2- 6502Programmer. Congratulations! Email me by Monday to claim your prize, or another winner will be selected. Didn't win? You can purchase the $35 ticket by calling Parkers for reservations at 440-933-9400. I want to share a recent dining experience with you. The (relatively) new TownHall in Ohio City contacted me and invited me in to try their Vegan Night menu. Every Monday, TownHall features a special vegan menu, with all sorts of items. I was intrigued. I am not a vegan, and only had a brief stint as a "vegetarian" for a while. I shy away from menu items listed as "vegan", and typically feel as though they lack flavor and creativity at many restaurants. I am pleased to say that TownHall surprised me, and I actually enjoyed some of the menu items that we sampled. I was invited to bring a guest with me, and we decided to share a few smaller items so that we could sample more dishes. Our server suggested the Black Bean Hummus ($6) with red pepper, jalapeno, and wheat flatbread. My friend wasn't a fan of this, and I thought that it was decent but not something that I would order on my own again. It was an interesting and unique twist on hummus, but flavor-wise it wasn't too exciting. The wheat flatbread was a little chewy too. We also ordered the Vegan Veggie Flatbread ($10) with organic tomatoes, cremini mushrooms, fresh chiles, and vegan cheese. The amount of flavor from the toppings and sauce on this flatbread surprised me. The fresh jalapenos gave it quite the kick (too much for my friend). The dough was a little gummy and hard to cut through, but held up well to the toppings. I couldn't quite get over the texture of the vegan cheese (very gooey and felt like it stuck to your mouth), but it was creamy and tasted great. I would eat this again, but probably not over a non-vegan flatbread option at TownHall. However, it was much better than my first experience with a TownHall flatbread. 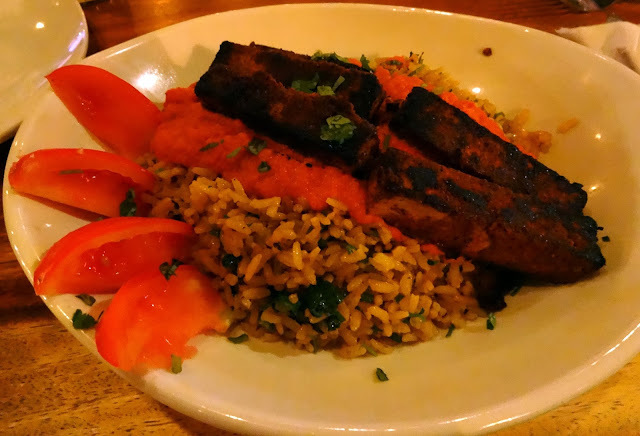 Our last small plate that we shared was the Tofu Etouffee ($12) with blackened tofu, tomatoes, onion trinity, and brown rice. This dish ended up being my favorite of the meal, and I would order this on my own again. The blackened tofu had such great spicy flavor, and the curry sauce over the rice packed a punch too. There was a lot of heat going on in this dish, so it isn't for the faint-hearted. It reheated well the next day too. 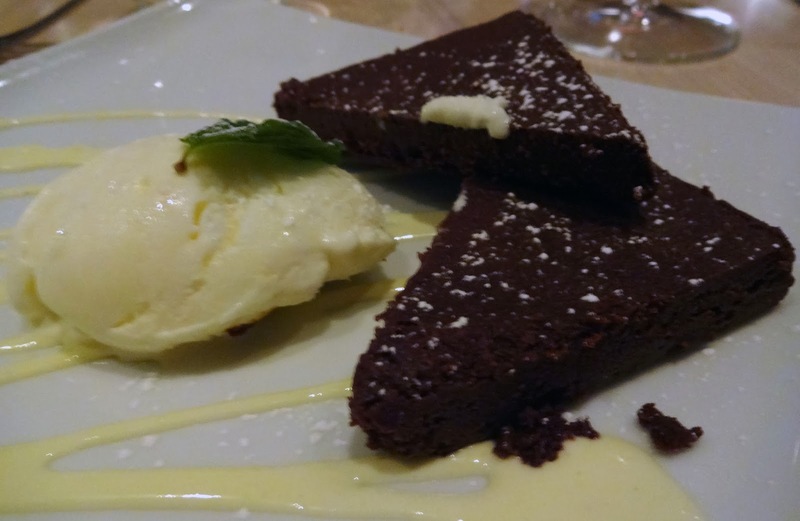 What's a vegan tasting with trying dessert? They have the most adorable pastry chef on staff, Liz, and she came out to our table to talk about her inspiration for their desserts. She is vegan, and seems to really enjoy playing in the kitchen and finding ways to make food healthy and fun. 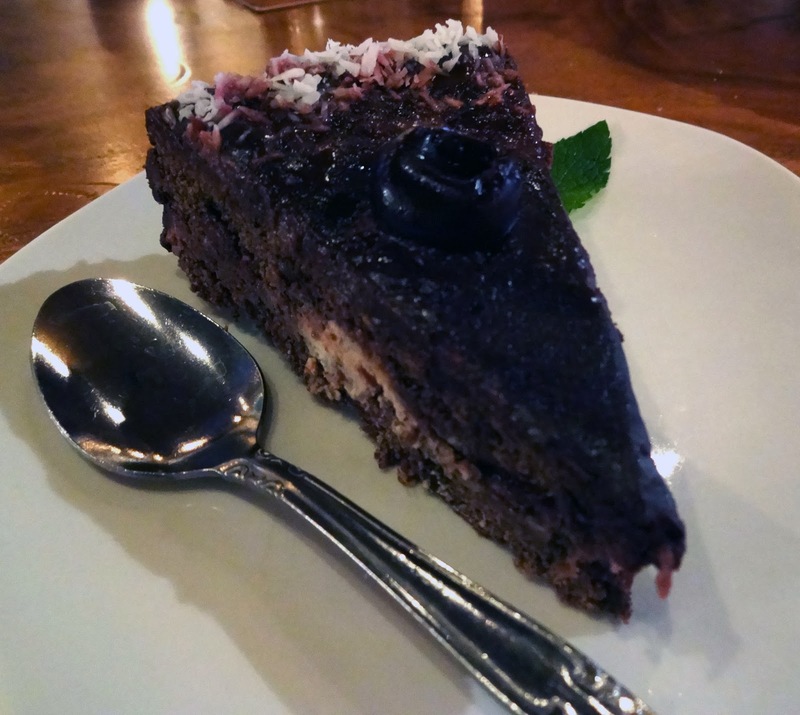 There was a vegan cookie, and the Black Forrest Cake available that night. Bring on the chocolate! This ended up being my least favorite dish of the night. Coconut is a common ingredient in vegan desserts, and this just tasted like too much coconut and not enough chocolate. Also, the texture was a little dry and tough. 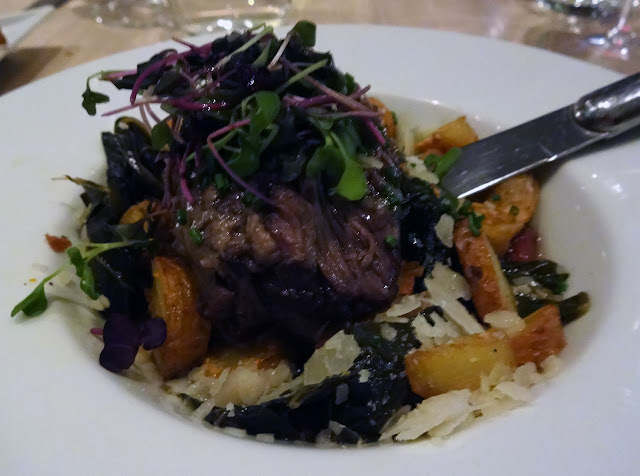 Overall, I was pleasantly surprised by our experience, and even found some dishes that I would order on my own again. I also want to try the Faux Pho and the Pan Roasted Corncake. A great beer list (and Craft Beer Night) rounded out our meal. So, what are your thoughts on vegan food? A few area restaurants are starting to cater to this crowd, and it's nice to see. We also ended up eating at Deagan's that Wednesday evening, which is Vegan Night. "R" really enjoyed their Vegan Paprikash. If you are vegan, gluten-free, or just interested in trying something new--- head out to these Vegan Nights and you may find yourself pleasantly surprised as well. Any other restaurants that you know of that do vegan food well? Disclosure: I was invited in to taste a complimentary sampling of TownHall's Vegan Night menu. My guest and I enjoyed our experience, and the opinions stated above are 100% my own. Last week, I visited Oberlin for the very first time. I popped out there to have lunch with a good friend to get some work advice, and I found a charming little town with a college vibe that immediately brought me back to my days at SU. 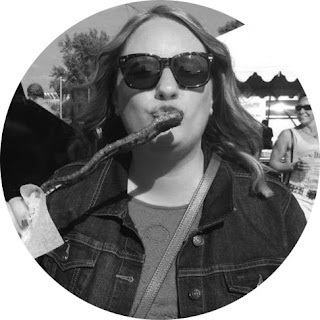 Amanda from Clue Into Cleveland had a great post on Oberlin this week, so check that out too. My friend had given me a couple of dining options to choose from, and I selected Tooo Chinoise. The Chinese bistro is located on West College Street, right in the heart of shops, restaurants, and other town businesses. It wasn't much to look at from the outside, but inside it was very nicely done. This wasn't your average hole-in-the-wall Chinese restaurant. I was drawn to their list of specials, and I let our server pick for me between two options. Every main dish comes with an Egg Drop Soup to start. I'm not a huge fan of egg drop soup, so I could have gone without. This version was only average at best, so I left about half behind. But the Beef with Jalapeño ($14)--- beef stir-fried with jalapeno and Chinese dried chili was fantastic! It packed a punch of heat from the fresh and dried peppers, and the beef was cut into manageable pieces and cooked well. With some white rice, and a side of steamed vegetables that I added for $1.50, this was a great lunch. I had about half to take home with me too! Service is a little slow here, so just be aware before settling in for lunch or dinner. Free street parking was available, surrounding the park just across the street from the restaurant. Even for lunch, they had a relatively extensive menu and I think anyone could find something here. What a charming town though! I can't believe that it took me that long to get there. I do have to say, driving there you feel like you are driving into no-man's-land. Even though it's the same distance that I drive east often enough, it felt so much longer because there's not much going on beside the highway out that way. Any other restaurants in Oberlin that I should visit? I hear that The Feve is very popular, but that you have to get there before the lunch rush to get a table. Have you ever been to Oberlin? Continuing to enjoy our new kitchen and cooking at home, "R" and I recently made a great side dish using one of our favorite vegetables---Brussels sprouts. 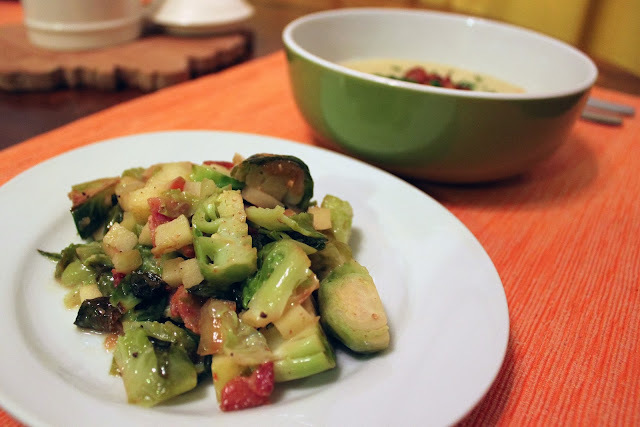 This recipe combined the vegetable with apple, bacon, and mustard...all good things in my book. Cook bacon in a large sauté pan over medium heat until crisp, 7-10 minutes. Transfer bacon to a paper-towel-lined plate, then increase heat to high. 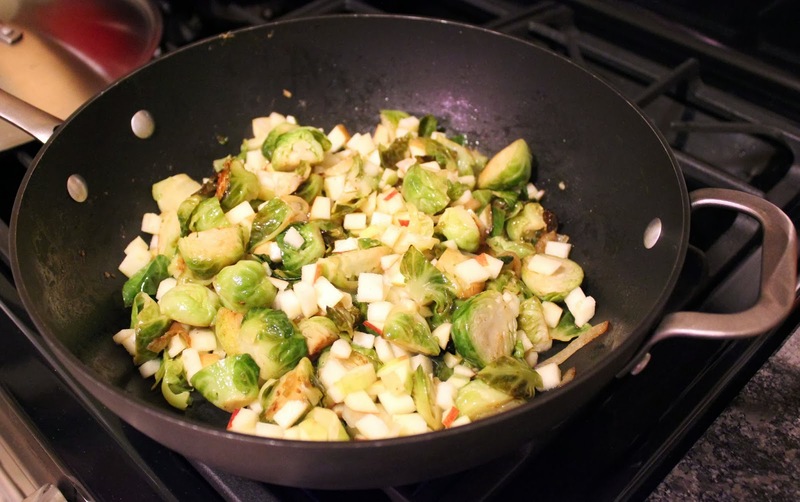 Add Brussels sprouts and onion to drippings and cook until sprouts begin to browns, about 5 minutes; season with salt. Deglaze pan with apple juice, scraping up any browned bits on bottom. Add mustard, cover, reduce heat to medium-low, and cook sprouts until nearly fork-tender, 6 minutes. 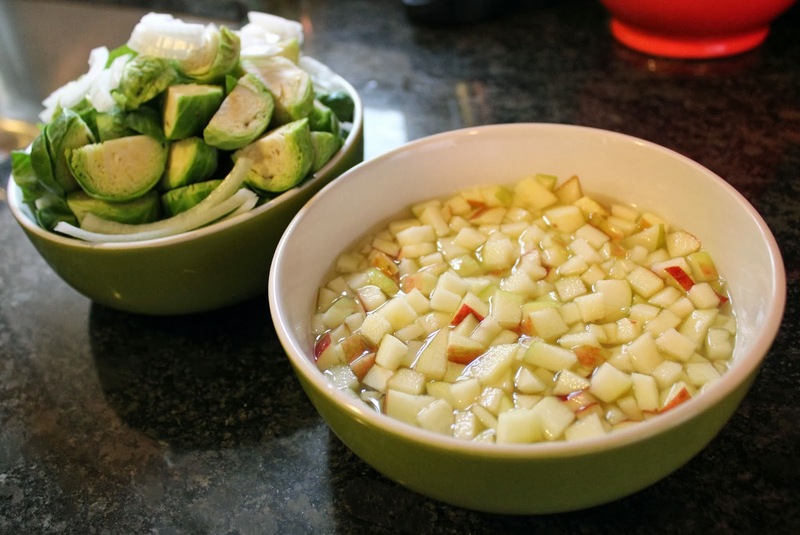 Add diced apple, cover, and cook until tender, 3 minutes. Stir in butter, vinegar, and bacon, then season with salt and pepper. Serve. We eat Brussels sprouts often, and this was a delicious twist on cooking them. I loved the tartness of the apple and vinegar with it, and who doesn't love bacon?! The recipe came from the April 2012 issue of Cuisine at Home Magazine. We paired this side with a bowl of Boursin Potato Soup (also Cuisine at Home recipe). 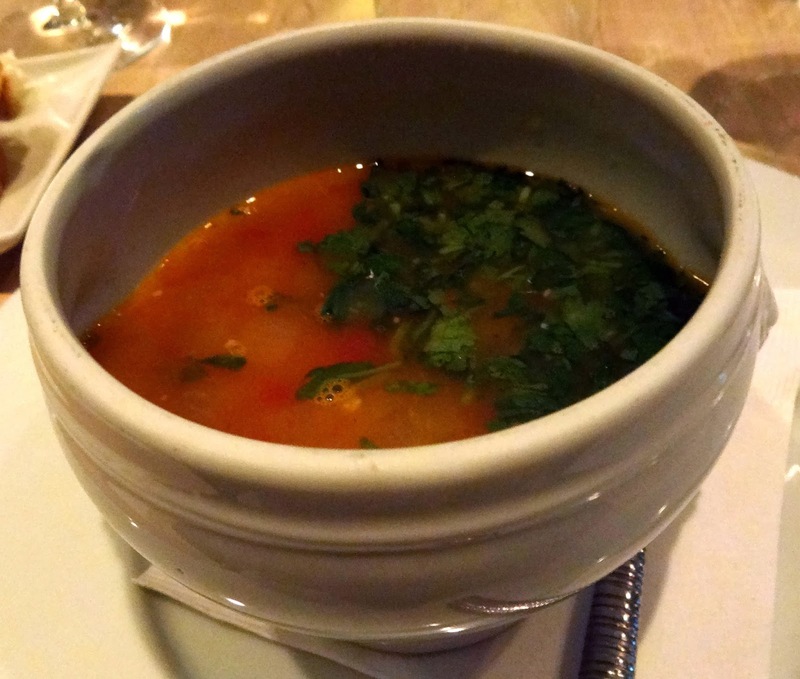 For that soup recipe, you'll have to head over to Crystal's blog today at Eat*Drink*Cleveland. I'm over there guest posting while she's enjoying and celebrating her recent wedding! Cheers to the happy couple, from one Cleveland food-lover to another. I hope that you enjoy both recipes! Has anyone been to the newly opened Parker’s Grille and Tavern in Avon yet? I think the food and drink menu looks great, and they've got some fabulous Happy Hour deals going on. Well, if you haven't been yet, then here is your chance. Parker's Grille and Tavern is hosting a tasting and beer pairing event with Great Lakes Brewing Company on Tuesday, October 29th. Tickets are just $35 for five sample tastings and a special GLBC glass. The event is from 6:00 p.m. - 7:30 p.m. at the Parker's Event Center, immediately adjacent to Parker’s restaurant on Walker Road in Avon. Tickets are now available, and you can call Parker’s for reservations at 440-933-9400. 1. Leave me a comment below, telling me which GLBC beer is your favorite. 2. "Like" Bite Buff and Parker's Grille and Tavern on Facebook. 3. Tweet "I want to taste Great Lakes beers with food from the new Parker's Grille, thanks to @BiteBuff at www.bitebuff.com." You can tweet once a day for additional entries. You only have to participate in at least one of these methods to be entered into the giveaway. I will select a winner on Thursday, October 10th using random.org. Good luck! Disclosure: Parker's Grille and Tavern provided me with four tickets to the event in exchange for this post. 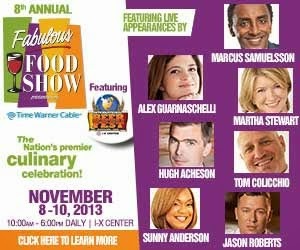 I will be attending with a guest, and one lucky reader will win the additional two tickets. All opinions stated are my own. Last month's @CLEDinnerClub outing was special. Organizer, Joe G., worked with local author Laura Taxel to take the group on a guided tour of the West Side Market...after hours! We had the place to ourselves, and it was breathtaking. I saw little details of the market that just get lost in the hustle and bustle of shoppers crowding the market during open hours. Usually, I tuck my head down and navigate my way around to the vendors that I need. I was in awe wandering around the market. I wish the tour had been longer! I was dying to see some areas that aren't open to the public too, but alas. Then the group headed over to Market Garden Brewery for the standard four-course dinner that the @CLEDinnerClub events typically include. I've only had average experiences at Market Garden Brewery in the past, but this time I really enjoyed the meal. I didn't care for the salad course (too boring and not enough dressing), but the duck breast course was all fall-like and delicious. Then, came the show-stopper. A perfectly cooked scallop over a corn and crab risotto. I wanted an entire plate of them! So many of my favorite ingredients all in one dish. This isn't on their current menu, but it should be. Hint, hint. Hands down, this was the best food that I've had from this restaurant. Great job. We also received a signed copy of Laura's book on the West Side Market. I can't wait to sit down with it. 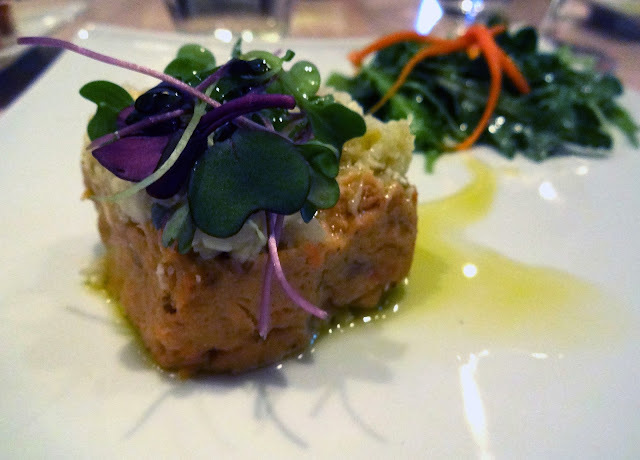 If you still haven't joined a @CLEDinnerClub event, what are you waiting for? Joe is bringing the group to Zack Bruell's Cowell & Hubbard on October 22nd. Bruell can do no wrong, and you always have fun meeting new people who share a love for good food. RSVP here. No disclosure here. I happily pay to attend each and every one of the @CLEDinnerClub events! I look forward to them every month.